The Book of Mormon doesn’t contain the “fulness of the gospel” because it doesn’t contain the temple rites. The class then did mental gymnastics to try to explain how the introduction to the book could claim it contains the “fulness of the everlasting gospel” when it clearly doesn’t. People advanced various theories but reached no consensus. All seemed to agree, however, that though the Nephites had temples, they were only “Law of Moses” type temples used for animal sacrifice and such. Those Nephites never had all the great gospel knowledge we do, the poor ignorant souls. Obviously there’s MUCH wrong with these assertions, primarily surrounding the wrong definition of “fulness of the gospel” as well as the false assertion that we know more than did Lehi, Nephi, Jacob, Enos, Benjamin, Alma, Mormon, Moroni, and others who actually knew God personally. But my purpose is not to take up that part of the argument. Rather, I’d like to discuss the temple at Bountiful and what took place there to help shed some light on our considerable ignorance. These people were not from Bountiful. Clearly this was the first time they had seen Bountiful since the destruction, which means they had not been at or near Bountiful in nearly a year. Hence, they marveled at what had changed since their last visit. They arrived at Bountiful at the closing of the year, most likely in preparation to observe the new year with religious rites at the temple. The fact that they made the effort to travel to the Temple and keep their religious obligations, despite the widespread destruction and loss of life, speaks to their dedication and obedience. This was not some random crowd of Nephites; rather they were devoted religious pilgrims who took their obligations seriously, even when they had a good excuse not to. When the Lord came, he found them sacrificing and obeying. And so this group found themselves in the right place, and right time, to meet the risen Lord. As you know, the Father spoke and introduced the Son, Christ descended, identified himself, and invited all present to participate in a ceremony providing undeniable proof of His identity. He then taught re-baptism, empowered baptizers, and taught His doctrine. He followed with His sermon, which is called the Sermon on the Mount in the New Testament. In actuality, this is the same sermon He likely taught to all the groups He visited after His resurrection. It reveals what sort of being He is, as well as the path to become like Him. He went on to declare that the Law of Moses stood fulfilled and had come to an end. 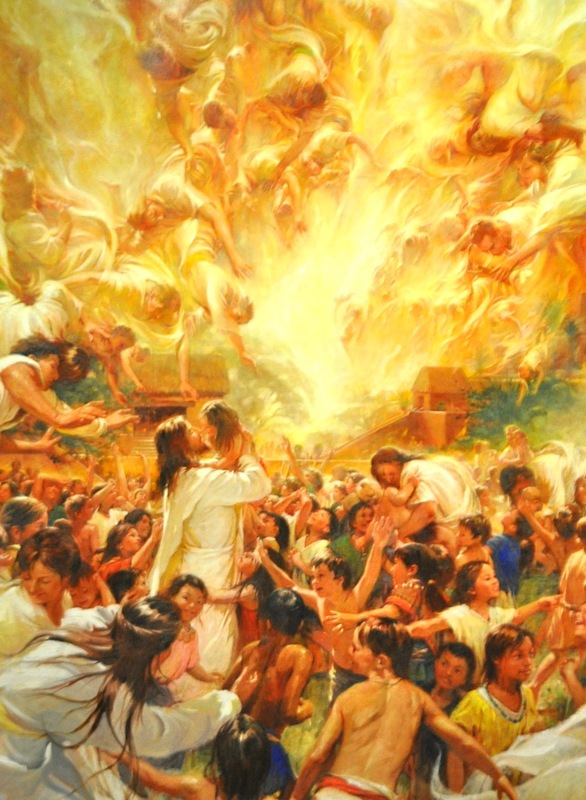 (3 Nephi 15:4-8) Therefore, if the purpose of the Nephite temple was only for Mosiac ordinances like sacrifice, presumably the need for temples had also come to an end. I’ve heard this same idea—that temples were only necessary under the “old covenant”—advanced recently to counter current preparations for the temple to be built at New Jerusalem. In response, the crowd wept and all but begged Him to stay a little longer. This display of faith, weak though it may have been, moved Christ with compassion. So just as He did at Emmaeus, the Lord stayed because He had been asked. His compassion led him to heal all the sick and infirm in the crowd, and having thus demonstrated His power to heal their bodies, the Master Healer set to work healing their weakness in understanding. The experience with the children was a prelude to what Christ yet meant to accomplish the next morning with the adults. He completed the first day’s ordinances by instituting the sacrament and giving rules for how this holy ordinance should be conducted. He prayed that they could move into a greater relationship with Him, not only having the Holy Ghost, but that they could have Christ in them. There’s deep meaning here to which I simply can’t do justice in a blog post, so we’ll move on. Note that he prayed not only for these twelve, but also for YOU, assuming, of course, you believe the words of the twelve whom Jesus chose. It’s important to note that again, Christ prayed for YOU to receive what the twelve just received. He also requested that they be allowed to move to yet a higher level of glory, from purification to glorification. He called them His own, because the Father had given them to Him; in other words, they were consecrated unto Christ. He then returned to the twelve, blessed them again, and they glowed white again. And again as before, at this point the record closes with a mention of the unspeakable, but no mention of what followed. As with the children, the sacrament is the next mentionable item in the record. Now, before you get up in arms about my using that word as if to imitate the LDS temple rites, let me suggest we have the whole thing precisely backwards. The LDS temple rites are a symbolic representation, or imitation, of the real thing. Christ gave these people an actual endowment, and it had the desired effects, giving the participants unspeakable knowledge of both holiness and the Man of Holiness. The LDS rites are just practice exercises to point to the real thing through ritualized imitation. Remember, Christ did this all AT THE TEMPLE, and He did it AFTER announcing the end of the old law. So let’s let go of the false concept that there’s no mention of the temple rites in the Book of Mormon, or that there’s no evidence for temples having any role after the law of Moses, or that temples are unnecessary under the “new covenant,” or other such nonsense. All such ideas are clearly false, as shown by Christ’s repeated actions on two consecutive days with two different groups, leading to the same results for both. This stuff wasn’t painstakingly included in the record merely for our entertainment. Christ prayed that YOU and I could each experience what the twelve did. And for that, we’ll need a temple to which the Lord can come and provide what is needed. The Book of Mormon illustrates this conspicuously. Let’s finish by taking a brief look at what the Lord taught after the endowment of the twelve. Remember, this was the stuff the Master Teacher couldn’t even teach before, because the crowd was too weak in understanding. But now he could, as witnessing the endowment had increased their faith and cleansed them of their false beliefs. Christ discussed the gathering of Israel, the building of New Jerusalem and the establishment of Zion, the triumph of His Father’s work and the fulfillment of the covenants God made to the fathers. He quoted Isaiah 54 and Malachi 3-4, all of which have nothing to do with the Nephite dispensation, and everything to do with what you and I are now watching unfold. Why was Christ’s message, that required such extreme measures to even be taught, completely about US, and not about the audience at Bountiful? Why did He tell them so much about OUR day, and nothing about their own? These questions ought to trouble us immensely, and we ought to implore the Lord night and day to explain to us why these things are so. The answers matter a great deal, and yet, how many of us even think to ask? And these things have I written, which are a lesser part of the things which he taught the people; and I have written them to the intent that they may be brought again unto this people, from the Gentiles, according to the words which Jesus hath spoken. And when they shall have received this, which is expedient that they should have first, to try their faith, and if it shall so be that they shall believe these things then shall the greater things be made manifest unto them. Did you get that? The record of Christ at the temple, and all that He did and taught there, puts US on trial to see if we’re willing to believe and receive higher things. Like the crowd at Bountiful, we lack the faith to receive the fulness of the message. Christ cured their deficiencies with an endowment at a temple. Might our cure involve something similar? When I ponder these things, and recognize the pattern Christ carefully showed us in the Bountiful ordinances, I yearn all the more for a house to which He can come and restore what has been lost to us. O God in heaven, let there be a temple reared in this generation! And verily I say unto you, let this house be built unto my name, that I may reveal mine ordinances therein unto my people; For I deign to reveal unto my church things which have been kept hid from before the foundation of the world, things that pertain to the dispensation of the fulness of times. Very enlightening. Thank you for sharing. 1) Is it important that the Lord give a commandment to build a specific temple? 2) If so, has such a commandment been given today? To compare, the LDS Church builds lots of temples today without God's commandment? At least I'm not aware of a commandment. How do you feel about those efforts? For this temple, if no commandment has been given, then could it be said we are hastening the work? Or is the rebuttal that contributors/builders would be exercising faith? What would make them/us different from the sincere, God-fearing builders of the Tower of Babel (assuming there were some with good intentions)? Or what about the temple King Noah's people built? I will say...the trial of our faith component (3 Nephi 26:11) has been on my mind for several days. 1. Yes, the Lord needs to command the temple. Building it without the Lord's command or approval would be folly. 2. No, the commandment has not been given that I know of. I expect it will be sometime in the future. I don't know of any intention to begin construction before the Lord commands it. As for the LDS efforts at temples, I do not know of any commandment to build them either. I did find the LDS endowment instructive when I was a member--but it was, as I wrote, merely an imitation. The temple possessed by King Noah was actually built by Nephi, generations before. It functioned as intended under Nephi, Jacob, Enos, etc., before the Nephite apostasy. Reclaiming this temple from the Lamanites was, I believe, the prime reason Zeniff was so zealous to possess the land of Nephi. Noah's people didn't build it, but he did attempt "improvements" by remodeling the interior. Under King Noah's wicked reign, the temple did not function as it was meant to. As for the tower of Babel builders, I can't comment, other than to say it's possible to attempt to usurp the things of God, in opposition to Him. We have no intention of doing that. I hadn't put two and two together about the temple King Noah was famous for being involved with. It makes a lot more sense now that I understand it was Nephi's temple. I thought about the history with that in mind. True, Nephi built it, and then after many generations, his people led by the prophet-king Mosiah, departed from the land of Nephi where the temple was located (Omni 1:12). The very next generation wanted to return to the land of Nephi, no doubt desiring to return to the precise area where the temple was (Omni 1:27). It wasn't until the 2nd generation that they realized their dream, led by Zeniff, who said he had a knowledge of the land of Nephi, where the temple was. So I believe it would be safe to state there was a very strong spiritual element to Zeniff's original expedition to return to the land of their inheritance, and remember Abinadi was one of the people most likely in Zeniff's party. It's highly likely Abinadi had very poignant and stirring spiritual reasons to return to the land, and the temple had to have been THE major, motivating factor for him to go through the afflictions he went through, and then once they fought off the Lamanites multiple times with much bloodshed, to see the apostate priests of Noah desecrate the temple with riotous living, that had to pain him greatly. And the Lord too. The record of Zeniff really was about a spiritual journey back home to their roots, led and inspired by the Lord, to come unto Christ with the temple as the centerpiece of their worship! I assume the Lord too cared so much about the temple desecration that he commanded Abinadi to boldly testify against Noah and the priest class which had gone completely apostate, who had been eating up the vineyard (wine bibbing) and exploiting the people and grinding the faces of the poor (2 Nephi 13:15). Just like we have happening today! Mormon didn't spell it all out like this, but it makes total sense! BAM! Kinda hits like a lightning bolt when it all clicks in, doesn't it? Here's an interesting sidenode that a friend told me about. Take a look at Omni 1:12, Amaleki, son of Abinadom is the last one to record anything in this book. In the last few verses, he mentions the group that goes up to the land of Nephi. In verse 30, he says he had a brother that went with him. Is it possible that Abinadi was the brother of Amaleki? That would also make him the son of Abinadom. The similarity in the names seems like more than just a coincidence. Daren, I've wondered the same thing and concluded that it's likely true that Abinadi was brother of Amalaki and son of Abinadom. That would also have made him next in line to keep the record, since Amalaki had no seed. But he was gone, of course, so Amalaki gave the record to Benjamin. This would also have made Abinadi part of Nephi's direct line. Well, in any case, the text records the curious statement about Amalaki's brother for some reason. Nothing is there by accident. If true and I suspect it is, Abinadi was Nephi's great great great great great nephew. Amaleki wrote two of the most powerful verses in all of scripture in Omni 1:25-26 and seem to be of the same quality of statement Abinadi would utter. Definitely cut from the same cloth. King Noah would have considered him a political threat as well, knowing his genealogy, giving him another motive to kill him on trumped up charges. I love this insight. It's beautiful. I second your thought on Omni 1:25-26. If you could distill the Gospel to its purest essence, that's it. Thanks for sharing. I was looking at D&C 84:59 yesterday, wondering about the condemnation the Lord has placed on us for not taking the Book of Mormon and other commandments seriously (the date of the revelation, Sept 22, the first day of Fall, can't be accidental). I appreciate these insights and conversations because what I glean from that verse is that scriptural awareness and knowledge seems to be a prerequisite for Zion. Or at the very least, a deep knowledge of scripture that leads us to bring forth the fruits of repentance and righteous actions so His "Holy Land" (Zion?) wont be polluted. I appreciate this series. Thanks! Adrian, I feel the power of your message through and through. Even before I got halfway through reading it I noted that I would be one of those Christ groaned for because of my wickedness. Should it not cause us to ponder and think if Nephi himself being one of those amongst the adults outside of that circle of fire around the children and he was supposedly the one who had sealing power and authority what does that say about the rest of us? It makes me literally weep. I completely concur with your sentiments and pray to God that we may see a Temple built in our day. Thank you and thank God, more importantly, for this message. Good point about Nephi not being included in the circle. As well, the Three Nephites, who were so faithful and focused on the Father's work that they were granted the blessing and burden of defying death, were excluded. Those four were very righteous and spiritual men, including Nephi who had the faith to have raised his brother from the dead. The fact these four men were faithful, righteous disciples may argue against the presumption that they were excluded "due to their wickedness". Perhaps they were excluded for other reason(s), including the need for those accountable to be re-baptized and receive the Holy Ghost (which happened the next day as recorded in chapter 19)? I've speculated that Jesus was deeply and visibly bothered by the wickedness of the people, because maybe there were children who had suffered at the hands of wicked people. With those abused children nearby in such an intimate setting, he couldn't help but publicly groan because of the wickedness of the people. But I certainly agree that as a type for the majority of the people, that WE, collectively, are wicked and in need of repentance. Adtian, I went back and read in Part 2 of this subject your previous addressing of the question I asked about "being commanded". You said you feel bewildered by the notion that we should expect to receive a commandment to prepare for and build a temple. I certainly sympathize with your perspective. I try to live my life by not "being commanded in all things" and avoiding being a "slothful servant." But both examples you quote are IN SUPPORT of the idea of getting a commandment first. The Brother of Jared was in fact commanded to build a ship in Ether 2:16 and after building them was asked specifically by the Lord to consider how to solve the lighting issue. The Lord was intimately involved in the process. In your other example, Nephi too received a commandment, even multiple times (1 Nephi 3:4 and 3:29), to go to Laban's house to get the plates. In fact, the importance and value of receiving a commandment or errand from the Lord is underscored by the famous 3:7 quote, "...for I know that the Lord giveth no commandments unto the children of men, save he shall prepare a way for them that they may accomplish the thing which he commandeth them." I believe receiving a commandment could be a rallying cry, so to speak. Is leadership inextricably tied to strongman priestcraft, or can there be leadership without priestcraft? Applying your reasoning (about not waiting to be commanded) to the Jaredites in Ether 2, they could have impatiently decided on their own to build ships. But they didn't. They camped out on the beach and waited FOUR years on the Lord. Their situation may be very analogous to ours and therefore instructive. What if after a couple years, they decided, after having convinced themselves they didn't want to be slothful, to build ships, and in a manner that would have gotten them sunk and killed because they weren't built "tight like unto a dish", for example? How would you have described the Jaredites, while they waited on the shore, previous to receiving a commandment to build eight ships, if they had started doing preparatory work to building ships? Smart and wise? Or premature? Nephi's story is similarly instructive, with a different lesson to be learned. What if he and his brothers had not received a commandment from the Lord via a prophet and an angel (1 N 3:4 and 3:29)? Would they have persisted after their lives were twice threatened and their property stolen, if it was their own idea? What would the result have been if they decided to get the plates without a commandment? The point is in BOTH these cases, a commandment WAS given and received through a true, authorized messenger. Could it be that the building of a temple (and prep to do so) does in fact "belong in a separate category from all the other things you and I do in faith every day"? I think the Scriptures could make that case. Noah received a commandment to do a big project that would impact the salvation of the world. Joseph Smith got the plates and received a commandment to translate them. I suppose he could have tried to translate them by his own power, but no, he received a commandment. Even Joseph received commandments to build a temple. He received several commandments. Perhaps we are at the stage of this renewed restoration when the Lord is silent on the matter? Many are quickly realizing that all church institutions have become corrupt (JSH 1:19) and we are waiting on the Lord, just like the Jaredites did for 4 long years on the beach. Maybe this is a necessary waiting time, to try our faith, as 3 Nephi 26:9-11 says? In that case, I suppose you could argue to start collecting money as a way of productively waiting and being anxiously engaged in a good cause. One can see some merit. But if the salvation of the world and the establishment of Zion is tied to the temple and miracles and power that will be manifest there, it at least sounds equally wise to wait on the Lord. The world needs prophetic leadership. I realize we got a prophetic message in the form of those 10 talks, which were stated to be authorized by the Lord. I don't believe it's a sin to ask for further light and knowledge, to ask for a revelation on this question. In reading page 111 of the Kirtland Council Minute Book on March 28, 1835 today, I read this which validates the propriety of my inquiring mind's question, "We therefore feel to ask him whom we have acknowledged to be our prophet and seer that he inquire of God for us and obtain a written revelation". I believe Denver is an authorized servant, like Jared thought so of his brother. Cannot we ask Denver for a revelation on the matter? It almost seems like Denver, is making all the arguments that prophets of old have made when they're personally not interested in being the leader. See Exodus 4 when Moses wanted to stand down and recall Jonah before him being swallowed by the fish, wanting to stand down. I would probably react the same way. Please forgive me if I sin in my request to receive further revelation on questions pertaining to the temple. First, we know the command to build a temple is coming. Denver stated this repeatedly in the talks. So it's just a matter of time. Second, it's clear that if we face a time limit like those in Nauvoo, we will fail without preparation before the commandment comes. When the commandment comes, I believe the Lord will relay it through Denver Snuffer. Until that time, we wait on the beach. But suppose the Jaredites knew the command would come to build ships, and the Lord would reveal how to do it...would it have been prudent to at least start gathering lumber? As for the examples I used, I selected them to show how the Lord operates. He outlines the desired result, then gives servants wide latitude to go about solving the problems for themselves. Were this not the case, we never could grow to become godly. I think the current situation is much the same. The Lord has made clear the command will come. So...it's up to all of us. What are we going to do about it? Get ready? Or wait to be told what to do? I also think that preparing for the temple demonstrates both faith and desire. Waiting to be commanded demonstrates neither. And remember, I'm not advocating doing anything more than prepare. I'm not saying we should start construction, or anything like it, until the Lord designates the spot and gives the command. But I do have a witness that preparing for the coming commandment is appropriate and pleasing to the Lord. That commandment may come sooner than we expect...and catch us unprepared. I don't want to see that happen. This is an interesting discussion about receiving a commandment to build the temple. It seems to be implied that there has been no command or encouragement from the Lord to gather funds. I don't claim to know, but perhaps the women who are gathering funds have received a command or encouragement from the Lord. And perhaps any who desire to contribute to the fund can receive confirmation of the Lord's approval and blessing to collect such funds. While there may eventually come a command via a prophetic voice and recorded revelation, I wouldn't wait as the Lord may be willing to work through us today in many ways if we call upon His name. While the Brother of Jared did receive a command, he was also chastened for not calling upon the name of the Lord earlier (Ether 2). I sit pretty close to what has happened and what is happening in this effort to raise funds for the Temple. I am personally acquainted with all three women involved; much closer to one than the others. One of the questions which is put to the women continually is, "do you have a commandment from God to begin raising funds for a (the) Temple?" The answer I have heard each of them give is an unequivocal "yes." But way more important to me is the answer I have received through my own struggles, prayers, and hearing the voice of the Spirit whispering to me. That answer to me is "yes, support My Word with your faith and your money's." The voice did not stop there, but the rest is personal to me. These women have witnessed their responsibility in what they are doing, and there are three of them. You, Adrian have spoken your personal witness that what they are doing is of God. Denver, in his blog post has spoken of his confidence and trust in these women and their effort. I speak here of my personal witness that this is of God. And the list of witnesses is growing daily as evidenced by the list of donors. How many more witnesses are required? Go to God for yourself and find out if He will give you a witness of this program's veracity. And if he says "yes, it's Mine," then support it. If not, and you find the struggle is more than you anticipated, wait patiently, or if the answer to you is "no," forget it. I have found it really is that simple. I can second Keith Henderson's testimony. Unlike him, I don't believe I've ever met any of the three women, nor would the vast majority of those who would be aware of this fundraising effort know me. I think I'm pretty much a nobody here, so I can easily go ignored. I comment here against my better judgment, as I did on the initial temple post where I mentioned my initial impressions leaned slightly in favor of the fundraising effort. Nevertheless, I can speak my personal witness that the Lord has revealed to me through the Holy Ghost that He approves of the effort of these women to raise funds for a temple. Since in my capacity for receiving revelation from heaven the most generous description of me would be "hard of hearing," it follows that anyone else ought to be able to receive their own personal witness. Thank you Keith & Jeremiah for your witness to the truth about the Temple Fund project. I'm grateful for your testimonies. I'm nobody special either, but the strong impression that came to me was the project is of God. I'm grateful to the women inspired to set it up, for what they are doing, and following God's command to them personally. I'm a slow learner but I have found that whatever God commands is right regardless of what anyone else may be proclaiming. As I listened recently to what Adrian said in his closing remarks at the Boise Conference, Friday Sept 9th, he asked the question "What is the Doctrine of Christ?". Maybe I'm way off, but the culmination of the Doctrine of Christ leads right back to the Temple in the New Jerusalem. And what is the purpose of the Temple? Ultimately to bring us into the Family of God. We must become His Family which requires a sealing to the Fathers. It cannot be done in any other way but in "The Temple", where the fullness of the priesthood can be revealed, yes? D&C 124:28- "For there is not a place found on earth that he may come to and restore again that which was lost unto you, or which he hath taken away, even the fulness of the priesthood." May the Temple be built in our day so the Most High can come. It just feels like everything connects. It's like this gigantic puzzle that is finally being pieced together. When the puzzle is finally finished what will be revealed is the Family of God. Oh these are exciting times!!!! I pray we all will make a concerted effort to not fail our God and rise up as a people who desire to know our Lord. I pray that we learn from the failures of the past, to be a more holy, more virtuous, more righteous people, a more dedicated people to the God of Abraham, the God of Isaac, the God of Jacob. Let us seek to do only what He asks of us and give what He asks of us, is my prayer. Keith, I think that is great. So can they share Exactly what the commandments was God gave them. I think it would be very helpful to hear "Thus saith the Lord" followed by God's instructions and get some real momentum on this. Robert, It first of all seems to me that you are asking something of me which is out of the context of the comment I wrote. I would not presume to speak for these women, except to say what they have said to me, which I said. I do think they have filled the requirement laid upon them by the Lord. They have written what was expected of them, and have signed their names to it attesting this to be their assignment. (See, www.thetemplefund.net; Also see the individual programs). Essentially what they have done is quote scripture which to them is applicable to the effort they are trying to achieve. Nowhere in their detailing of their assignment do they mention that part of it is to convince you or any other person to support their effort. That’s what I tried to make clear in what I wrote, was that way beyond their personal assignments from the Lord to establish this fund, was my personal responsibility to find out if this is something I should support. If they tell you and others, “thus saith the Lord,” is that going to mean as much to you personally as the Lord saying to you directly, “Robert, based upon your inquiry to me, I the Lord your God require your support of this effort,” or some such statement? He has said in other places about other highly anticipated blessings that, “I will try my people first,” Could this be that trial? I believe it to be. With regards to momentum of the effort, I think we would all be well advised to not look at one visible barometer and judge that is a complete indicator of the effort. From what I have found out, this is the Lord’s work, and whether it appears successful or not to our eye, the Lord Himself will use the efforts of people He has commanded to make His program work for the benefit of Zion, whether to establish it immediately or whenever He chooses, or wherever He chooses. Keith, perhaps I misunderstood. When you said they had received a commandment from God I thought you meant that they had received a direct commandment like in a revelation which could be shared with everyone. If there was a revelation from God with an authoritative command as you suggested I always think it is good to put it out there so people can read God's word for themselves and then pray about it. You would think that if God is going to try his people that he would at least deliver to them his actual decree just as he did with Joseph Smith and in all the other scriptures before condemning them. Without that it kind of feels like innuendo and guess work. What I meant by momentum was that people are more often willing to put their energy and funds to really accomplish something when things are more clearly defined-- a real vision. I'm not sure I understand your question. I'm hoping you'll clarify. Here are a couple of things to consider in formatting your clarification. 1. Christ touched each of the twelve and gave them power to give the Holy Ghost by laying on of hands (Moroni 2). But the text is also clear that they each received the Holy Ghost after baptism, without the laying on of hands (3 Nephi 19:13), as is taught in 2 Nephi 31:13. If you read the scriptures closely, you'll find that "giving" the Holy Ghost by laying on of hands is confined to those who have had personal, physical contact with Christ. In other words, true apostles. 2. The twelve likely already held priesthood (and had been baptized previously, etc.) Heck, Nephi's own father was recorded as baptizing the Nephites when Samuel preached. And Nephi himself raised his brother from the dead. But Christ specifically authorized them to baptize in the new dispensation, and he did it by his own word. If the Lord says it, it is done. He doesn't have to lay on hands to make it so. Nevertheless, the Nephites did practice priesthood ordination from man to man, as recorded in Moroni 3. But both of these things have nothing to do with the endowment, which is the topic of this piece. So I'm hoping you'll clarify how I've ignored laying on of hands in discussing the endowment. There's a difference between "giving" the Holy Ghost, and "receiving" the Holy Ghost. In the LDS church confirmation, an invitation is extended to "receive" the Holy Ghost, leaving it up to each individual to seek and receive this gift from God. And the scriptural promises are clear that this is available to all who repent and are baptized. The ability to "give" the gift of the Holy Ghost by touch (laying on of hands) is confined to apostles--meaning those who have had personal, physical contact with the savior. If you read the scriptures carefully, you'll find this is the case whenever this principle is mentioned. In the Doctrine of Christ, the Lord does NOT mention the laying on of hands in his promise that those who repent and are baptized will receive. He requires no other conditions, and specifically commands us not to add any. Therefore, it appears the "giving" the Holy Ghost by touch is an exceptional and unique situation, whereas "receiving" the Holy Ghost through repentance and baptism is the rule. 11 Yea, repent and be baptized, every one of you, for a remission of your sins; yea, be baptized even by water, and then cometh the baptism of fire and of the Holy Ghost. Question: Who is bestowing the Holy Ghost in this verse? Answer: The apostle on whom Jesus laid hands and specifically gave this power. There is an undeniable difference here. Now, to answer your direct question, NO, the laying on of hands is not required as a step to receiving the Holy Ghost, and there is no scriptural proof that it is. Christ was quite adamant about what He requires when He declared His doctrine, and the promise of the Holy Ghost is repeatedly offered without any mention of laying on of hands. Scripturally, apostles (and only apostles) can “give” this gift, but it is not a requirement and this is not the only way to get it. Garth, this is FAR afield from the topic of this post and has nothing to do with the temple, its purposes or practices. So I’ll invite you to contact me personally if you wish to continue this discussion. Likewise, if you have a comment pertinent to this post, you’re welcome to leave it here. You said, "That commandment may come sooner than we expect...and catch us unprepared. I don't want to see that happen." But aren't you relieved and satisfied that the Lord doesn't give commandments to us except He prepares a way for the commandment to be accomplished (1 Nephi 3:7)? The main question I had (and you concurred), logically and scripturally, is the importance of receiving a commandment esp on such a monumental milestone in human history. What I am able to understand is that you and others feel the time to prepare is now, and the only justification that the cart is not before the horse is because you must feel the construction start date is very close. But Denver has made it crystal clear that it may not even be in this generation. So it must be that the intent of collection efforts now is to persuade the Lord to give the commandment now, or soon, by showing him some action which demonstrates faith? I sense that it may not be politically correct to raise such questions, but even Denver has confessed to his understandable impatience: "Like men in all generations, I too want to see the foundation of Zion built in my day. This desire sometimes leads me to have unreasonably high expectations for others" (12/25/14). He counsels further: "You must assume the burden of distinguishing light from darkness, truth from error, and pretenders from those sent by the Lord with counsel from Him. Trust no man. Go to God and ask Him about everyone who teaches and everything taught." He said in a blog post (I think it was last year) that one thing that really astonishes him is how the Lord is so "not in a hurry," or something to that effect. That if Zion doesn't come in this generation because the people don't rise up, then it won't come. He's not going to compel people. He's also said "officially" in Talk 6, "There is absolutely no reason for the Lord to tell you another place to go and pollute, if you don't rise up an bring within you the worthiness necessary, to turn at last, a place into the New Jerusalem." Denver actually makes the case to do nothing but "rise up" and become of one heart and one mind. He says, "There is no reason to assemble you together at any spot until then. You can do everything that needs to be done preliminarily, wherever you dwell at present." With this in mind, I can sympathize a little with the Jaredites on the beach as they waited for 4 years. And can see what Denver means when he says, "Instead of judging the failures from before, you can start to walk in the path they (the Saints in Joseph's time) attempted. Then instead of judging, you can empathize with their failures. You will come to some appreciation for the fact that it is not going to be any easier for you than it was for them. You can find out what they learned when they attempted it." But what of prophetic leadership, in the form of the Lord actively giving revelations like in Joseph's day (esp the years 1829-1833)? That is the pattern God has always used. There is a prophet and he leads. But Denver harshly condemns the notion of prophetic leadership when he says, "The fact of the matter is we all tend to want that “Strongman” We want that ruler, that presiding authority. We tend to want someone to take control, precisely because we don't want to go through the effort involved in common consent, and required for the common sense of governing ourselves. It is just so much easier to pay, and pray, and obey, than it is to go, do, and rise up, to be one with our Lord and our God." I get this! I'm repenting of having a darkened mind, and of making men my idols. BUT, the Lord DOES call prophets, and they ARE important. So what is Denver saying? WE are supposed to rise up, and know the Lord for ourselves and get plugged into the True Vine. And yet the Lord has a work to do, and He does it through His servant, but the servant is saying to not expect him to be a leader.? Enoch was a prophet-leader, right? He played the role of a leader. The Brother of Jared played the role. Nephi played the role of leader (2 Nephi 5:19). Should we not expect Denver to be a prophet-leader? Does it seem like he is purposefully low key and sort of refusing to be thrust into the leadership role, as even Moses pushed back (Exodus 4)? Look, if you were to hold a gun to my head and require me to tell me what I really believe, I'd confess I believe Denver is a true messenger. He's got the fruit, and he's caused fruit in my life by inspiring me to repent and pray and seek Christ. I don't see how one can read his writings and not testify that they are light and truth! Thinking through this, I guess we are now at a time somewhat analogous to the time when the Jaredites were waiting on the beach before receiving a commandment to build 8 ships. Or when Lehi and his family left Jerusalem. There was LOTS of murmuring by his family, and even Lehi himself at one point, when things were stagnate and not progressing quick enough. They wanted to get to the promised land and settle down. So did the Jaredites on the beach. Ether 1 perfectly illustrates how I feel. I feel like Jared who kept wearying his brother to go and pray and inquire of the Lord's will. He had the same desire as I have, and many of us I bet, "And who knoweth but the Lord will carry us forth into a land which is choice above all the earth? And if it so be, let us be faithful unto the Lord, that we may receive it for our inheritance." We want Zion. That's what Jared had faith in and desired, as I read those words. Sounds very similar. Jared leaves us a success story in how to interact with the Lord, which is that we ask the Lord, or rather, we ask the Lord's chosen servant for direction, for His will to be made manifest to bring forth Zion. Let us weary him with our petitions! And maybe He will say through a true prophet, "And there (like on some sovereign Indian reservation in the Rockies) will I bless thee and thy seed, and raise up unto me of thy seed, and of the seed of thy brother, and they who shall go with thee, a great nation. And there shall be none greater than the nation which I will raise up unto me of thy seed, upon all the face of the earth. And thus I will do unto thee because this long time ye have cried unto me." Let's beg the Lord. Perhaps we are not begging the Lord enough. He answered and gave direction "because this long time ye have cried unto me"!! It's been 2 years and 4 months since Denver's 10th "Thus saith the Lord" talk. I'm thrilled to be on the beach with the Jaredites, having left the idols of Babylon in many ways and not having my language confounded and to have my kin with me, and HALLELUJAH (God be praised) for these blessings, but let's get going (as Jared begged his brother to "go and inquire"). I ask Denver to cry unto the Lord and ask if He will manifest His will regarding the WHEN and WHERE, so that we not be left to our own devices, opinions and speculation about such a momentous topic of Zion and her temple. I agree with Robert Kay above who said that without a clear commandment, "it kind of feels like innuendo and guess work." I don't think it's a sin to ask Denver, if he is in fact the spokesman for the Lord today (and I believe he is), to do exactly what Jared asked his brother to do. "O Lord, thou hast given us a commandment that we must call upon thee, that from thee we may receive according to our desires" (Ether 3:2). I have been pondering this for weeks. I re-read Denver's talk again from Boise back in Sept., and he gave wise advice on the topic of wanting to move forward with Zion. "Virtue and patience are required of us every bit as much as it has been required in every age. We cannot wallow in sin, nor be prideful, and expect to do any better than those who already failed. The best guard against our failure is humility, meekness, longsuffering and patience. We must not charge ahead when the Lord has not prepared the way for us to proceed safely. There is much still to be done. But it must be done when, where and how the Lord directs; and that also not in haste—because haste brings confusion, resulting in pestilence (including violence and jarring contentions). (See D&C 63:24.)" I am comforted by the Lord promising that he won't give a commandment unless He prepares a way for the commandment to be accomplished. "God’s people are always required to build a temple. Therefore, there needs to be preparation for the coming commandment. When the Nauvoo Temple was commanded to be built, the resulting struggle lasted for nearly six years before it was abandoned. It was never completed. That repeated failure will not please the Lord." May we not displease the Lord. I am not very familiar with the Nauvoo era. But I'm smart enough to see that the temple was commanded to be built to restore certain things, and to be done in a timely manner. And it wasn't completed (a matter of history). And affliction to the Saints followed (a matter of our history), and the temple was destroyed (a matter of history). Obviously the Saints were moved out of their place (a matter of history). Denver is saying "there needs to be preparation for the coming commandment." I do humbly ask Denver to pray unto the Lord to receive knowledge of when and where to build His most holy temple. I have never heard God's voice myself (I continue to ask), but I believe God does speak to chosen men during times of restoring lost truths (this is the pattern we are forced to acknowledge), and I believe God has been speaking to Denver. So please cry unto the Lord, Denver, and see what the Lord would command to be done. Adrian, I appreciate the thought you put into your most recent post. However, is it wise to start with the end in mind? To draw a conclusion then make God's word fit thereby putting Him in a box? After reading 3rd Nephi again, in my opinion you really have to sttrreettcchh to come up with some things you put across as fact. Yes, I do think we need an endowment but it is an endowment of power and that was what Jesus was showing the Nephites--not a masonic endowment full of masonic gestures and promises made to take your own life if you tell it. I've read many of your blogs and most of the time I mostly agree with your conclusions. But this time I felt impressed to give my two cents worth if it is only worth two cents:-) but at least I can put it out in the ether a new thought that those of us struggling with the endowment can consider. Thanks. I look forward to your next post. Thank you for your perspective. I agree, Jesus did not show Masonic gestures or give what LDS people would recognize as "the endowment" presentation. He gave the real endowment of power, which is what the symbols are intended to point to. I don't think its a stretch when I point out what the text plainly shows. If you mean I stretched by comparing it to the LDS endowment, you may have misread my intention. The LDS endowment is a corrupted symbolic representation designed to point to the real thing. Christ showed the real thing. Thank you for responding so quickly! Forgive me for disagreeing though. You said, "The LDS endowment is a corrupted representation to point to the real thing." I do agree that Jesus showed us the real thing but the endowment as developed by Brigham Young is not the real thing that was revealed to Joseph Smith. Brigham's hands are stained with all the edits he made to the original history of the church so that now it takes a good deal of intense research to find out whether Joseph Smith really said something or not. We have to rely on the spirit of Jesus Christ to tell us the truth as even the book of mormon has been slightly tampered with. Just my opinion though. I'm still searching because I don't like being lied to and I want to know the truth. Thanks again! Yep! That's why I called it a "corrupted" symbolic representation. Does avoiding the corrupted, symbolic representation developed by Brigham, and getting the genuine thing from the Lord, look similar to the way this movement simply decided to use the sealing ceremony that the LDS church has been using ever since Brigham Young "developed" the sealing ceremony? 'Cause, to be honest, it seems like all the temple-type ordinances this movement uses are just exactly the same as the ones "Brigham developed" (Sealing, prayer circles/true order of prayer, garments for those who still wear them, etc.). Is that what is intended for the rest of the temple ordinances as well? You know, condemning Brigham Young while adopting what he preserved at the same time? I don't know, I guess the standard answer will be that the form the rites of this temple will take are yet to be revealed. Still, if the present, and past, status of this movement are any indication at all of its future practices (with regard to ordinances), then I conclude that both continued condemnation, and imitation, of Brigham Young will be the order of things. Something better is coming. That's the point. With DC 93:6,18 being fulfilled today with the publishing of St. John's testimony to the world on Denver's website, I feel like God has kicked His strange act into a higher gear. We are on the beach, waiting, like the Jaredites, but it's clear we have a prophet in our midst. How incredibly exciting! "I will be giving three talks later this year in California, Texas and Atlanta. I have been sent to give these three messages. I do know God. I have been ministered to by Him and He has prepared me to minister to others. Like Paul, who was sent by God, I will also tell you of an unchangeable God, who is the same yesterday, today and forever." If this is the testimony of john then help me to understand why Doctrine and Covenants chapter seven is not included in it. D&C 7 was taken directly through the Urim and Thumim from the parchment that contained the testimony of John. Denvers writing on John does not contain this. Someone please help me understand what is going on here.